Why Are Pacific Coast Sea Stars Melting? – Neptune 911! Home › Climate Change › Why Are Pacific Coast Sea Stars Melting? Starfish are dying in massive numbers due to a disease outbreak that melts the animals into a white goo, leaving researchers scrambling to explain the troubling phenomenon. Dubbed Sea Star Wasting Syndrome, the disease is most prominent on the Pacific Coast, ranging from Southern California to Alaska, where at least 10 species of sea stars have been reportedly inflicted. 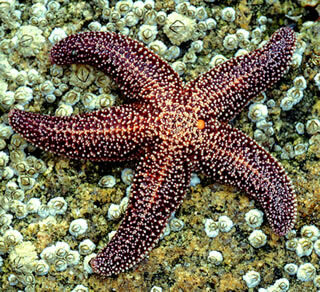 According to the Associated Press, up to 95 percent of sea star populations in some tide pools have been killed. While major sea star die-off was documented in Southern California in the 1980s and 1990s, the current outbreak, which causes lesions, tissue decay and eventual loss of limbs, in unprecedented. UC Santa Cruz’s Pacific Rocky Intertidal Monitoring Program has been collecting data on the sea star deaths since June, when Washington’s Olympic National Park found up to 26 percent of sea stars in the park were diseased. A map of the data collected by the program shows that since that finding, incidences of the disease have been recorded all along the west coast. According to the Press Democrat, two scientists from Raimondi’s team are leaving this week for a multi-month sweep of California, Oregon and Washington to quantify the outbreak and further understand the disease they have little explanation for yet. The Pacific Rocky Intertidal Monitoring Program reports that one major commonality of all the inflicted sites is that the outbreaks followed periods of warmer ocean waters. “We’re not having an El Niño year this year. That’s what’s really troublesome about this,” Raimondi told CBS News. “I don’t think there’s been a spread, but it’s likely that the same causal factors are contributing to these separate outbreaks,” he said. Raimondi explained that the sea stars’ decline has dire consequences for the ocean’s biodiversity. One of the primarily affected species, Pisaster ochraceus, eats mussels, which will crowd out other species if their sea stare predator continues to disappear.